Hello there! So who else is thinking summer everything!? I know I am! 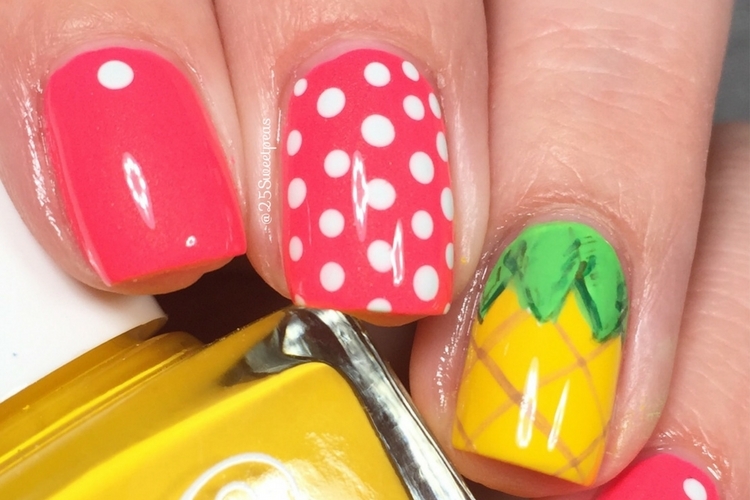 Today I am back with more Pineapple Nails because I am just obsessed with all things Pineapples! For this look I wanted something quick and simple and believe it or not this was that! The hot pink is China Glaze Bite Me. It has a slight shimmer in it that you can catch in some lighting and its gorges! Then the yellow is Serendipity Nail Polish Bottomless Mimosas which is the ultimate Pineapple Yellow! So after doing these I just googled Pineapple Nails and oh my! Who knew there were so many different styles of pineapple nails! I know want to just go recreate them all! LOL! So if you are a pineapple fan let me know! If you are I would be more than happy to do some more pineapple nails! Well that is it for this post. I hope you all have enjoyed these, and are as obsessed with pineapples as I am! :) Don't forget to let me know your take on pineapples in the comments below! Also if you aren't a fan of pineapple comment what your favorite fruit is to wear on your nails. I think I need to do more fruity looks.